Labotex is very proud to be an accredited laboratory under the ISO 17025 standard audited by BELAC. This means any test performed in our laboratory is fully accredited under the ISO standard. The description of ISO 17025: General requirements for the competence of testing and calibration laboratories. To gain the ISO 17025 Labotex underwent an extensive auditing process performed by BELAC, a Belgian governmental institution which is the National Secretary of Economics Affairs, Department quality & innovation. 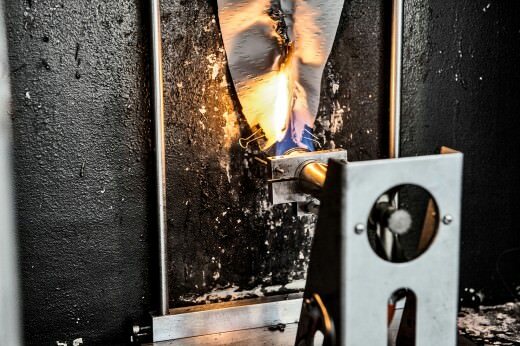 Labotex performs a wide range of mechanical and fire resistance tests according to the highest standards laid down by leading international organisations. 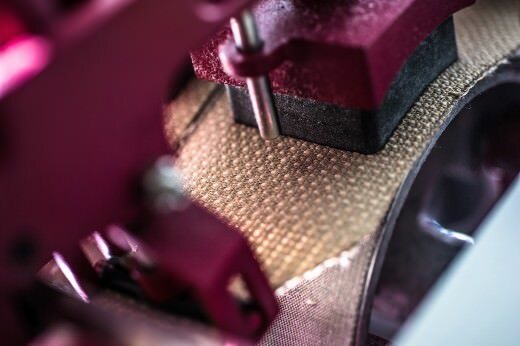 Martindale test assesses fabric’s resistance to abrasion. The fabric sample is placed in the Martindale machine and tested for abrasion. The fabric sample is assessed at certain intervals to identify yarn breakages and appearance changes (example: loss of pile or pilling). 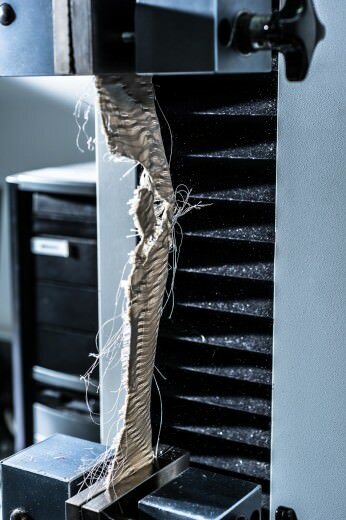 The test is completed when the fabric sample reaches a specified number of broken threads or when the appearance of the fabric has substantially changed. The pilling test assesses fabric’s resistance to pilling. The fabric sample is placed in the Martindale machine and tested for pilling. Compared to the Martindale test, the machine now rotates in a more compact motion, applying more pressure to a large surface area. At intervals of 500, 1000, 2000 and 5000 rubs the pilling is observed and assessed by means of a pilling scale (1 to 5). 5000 rubs is considered the final result of the test. Generally a pilling scale grade of minimum 3-4 at 5000 rubs is acceptable. Wyzenbeek test assesses fabric’s resistance for abrasion (mostly used in North America). 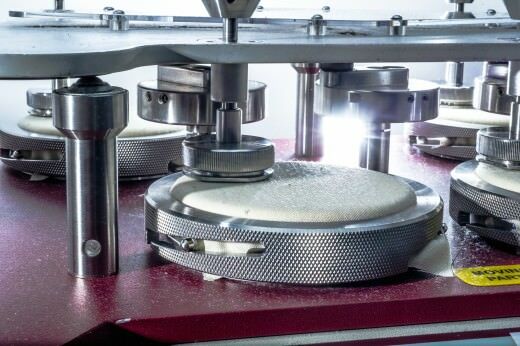 A fabric sample is placed in the Wyzenbeek machine. The fabric is rubbed in a back and forth motion on a cylinder covered in either cotton fabric or wire screen. The fabric sample is assessed at certain intervals to identify yarn breakage appreciable wear, colour loss and loss of pile. The test is completed when 2 yarns are broken or when the appearance of the fabric has substantially changed. The seam slippage test measures the fabric’s movement at the seam (mainly for upholstery fabrics). The fabric samples are sewn together both in the warp and the weft direction. The fabric is pulled from both sides to 180N and then released to 5N. The opening of the seam where the two fabrics are sewn is measured. A seam slippage of maximum 4mm is acceptable for upholstery fabrics. 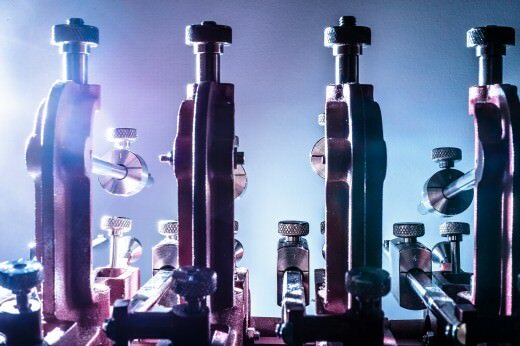 The tensile strength and elongation test measures the fabric’s strength and percentage of elongation until rupture (mainly for upholstery fabrics). 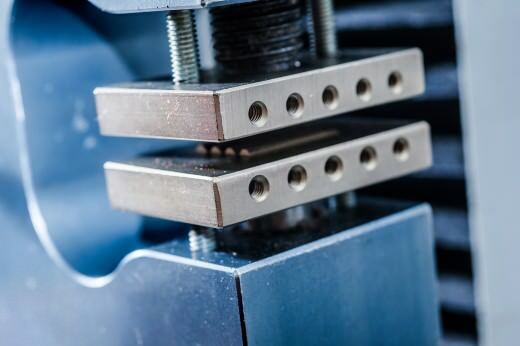 A sample is clamped in the machine at both ends and pulled in opposite directions until breakage. The breaking force and percentage of elongation at rupture are recorded. A tensile strength of minimum 350N and an elongation of maximum 50% is acceptable. This test measures the amount of force needed to tear the fabric (mainly for upholstery fabrics). A small slit is manually cut in the centre of the fabric. The fabric is then clamped in the machine at both ends. The fabric is then pulled from both ends until it starts to tear, at this point the force needed to tear is measured. A tearing strength of minimum 25N is acceptable. Colour fastness to rubbing test (also known as the ‘Crock’ test) records the amount of colour that a fabric emits when rubbed (mainly for upholstery fabrics). A fabric sample is placed in the crock test machine. The fabric sample is rubbed with a wet and dry cotton cloth. The amount of colour that stains the cotton club is evaluated against the grey scale (grade 1 to 5). CFL records the fading of the colour of the fabric when exposed to light. A fabric sample is placed in the testing chamber together with a standard blue scale reference fabric. This blue scale wool fabric consisting of 8 dark to light blue shades, is the standard measurement tool used to record the fading of a fabric. The fabric sample and the blue scale reference sample are compared with one another and rated on a grade from 1 to 8. The higher the rating, the better the fabric will perform to daylight. Generally a colour fastness to light of blue scale grade 4 is acceptable. The Colour fastness to water test records the amount of colour that a fabric loses when dipped in water. 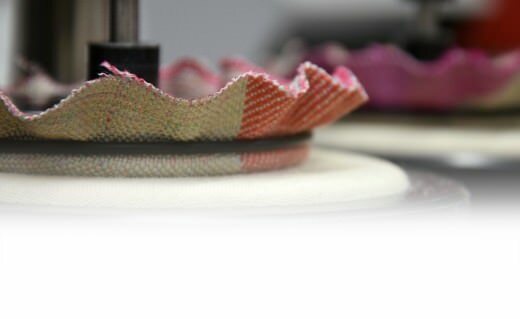 A fabric sample is sewn together with a piece of standard multi-fibre fabric. It is first drenched in water and then placed under pressure between two plates. The colour change of the fabric sample is measured using the grey scale (grade 1-5). The multi-fibre fabric is also evaluated and rated on the grey scale which will determine the staining level to different fibres. A colour loss and staining rating of 4 on the grey scale is acceptable. The colour fastness to washing test records the fabric’s fading resistance to washing. 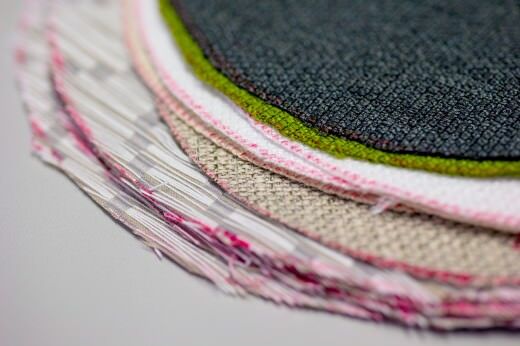 A fabric sample is sewn together with a piece of standard multi-fibre fabric. It is placed into water mixed with standard washing detergent. Small steel balls are added to simulate the mechanical action of a washing machine. The colour change of the fabric sample is measured using the grey scale (grade 1-5). The multi-fibre fabric is also evaluated and rated on the grey scale which will determine the staining level to different fibres. The colour fastness to dry cleaning test records the fabric’s fading resistance to dry cleaning. 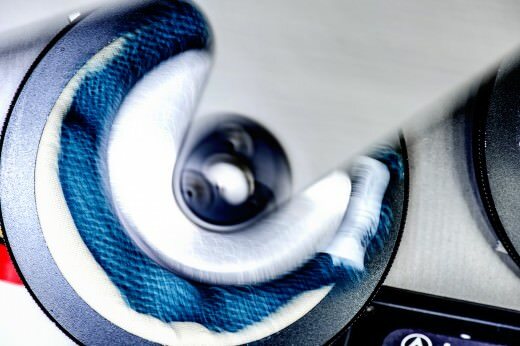 A sample fabric is placed into perchlorethylene together with a steel disc to stimulate the mechanical action of dry cleaning equipment. 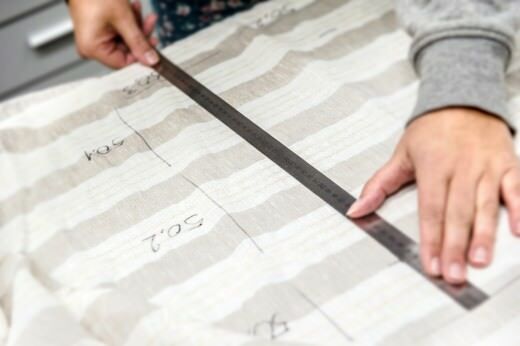 The colour change of the fabric sample is measured using the grey scale (grade 1-5). A colour loss of 4 on the grey scale is acceptable. The Dimensional Stability test records the dimensional stability of the fabric when hanging. The test fabric is hung in a room with controlled atmosphere for 3 weeks (20°C and 65% RH). The fabric is measured at various intervals in warp and weft direction. Any difference in dimension is recorded. A dimensional change of +/- 0,5% is acceptable. The Washing, Dry Cleaning and Ironing test records the fabric’s reaction to cleaning and ironing. The test fabric is washed and dry cleaned. It is measured in the warp and weft direction. Any difference in dimension is recorded. The fabric is then ironed with and without steam and measured in the warp and weft direction. Any difference in dimension is recorded. After washing and drying, the colour change of the fabric is evaluated using the grey scale (grade 1 to 5). IMO standard – FR fabric test for international marine industry and cruise ships. A fabric sample is placed vertically on a metal frame. A flame is applied to the surface and bottom edge of the fabric for 5 and 15 seconds. FR fabric test for European Contract industry. Following completion of the three tests, the fabric can be categorised as EN13773 from class 1 to 5. Class 1 being the highest standard for FR and class 5 being the lowest. NF P92-503, 504 505 and 507 standard – FR fabric test for French contract industry. Following completion of the NF-P92-503, NF-P92-504 and NF-P92-505, the fabric can be categorised as NF P92-507 and classified from M1 to M4. M1 being the highest standard for FR and M4 being the lowest. BS5867 part 2 type A, B and C standard – FR fabric test for British contract drapery. The fabric is tested before and after cleaning. A fabric sample is placed vertically on a metal frame. The metal frame has 2 measurement markers. A flame is applied to the fabric surface for 10 seconds. No part of any hole nor any part of the lowest boundary of any flame shall reach the top edge or either vertical edge of the sample. If so and if there is no separation of any flaming debris droplets, the fabric shall be deemed to comply with the requirements of this standard. A fabric sample is weighed before the test. The fabric is hung vertically on a metal bar in the test chamber. A methane flame is applied to the surface of the fabric for 45 seconds. This is repeated 10 times with the same size sample of the same fabric. 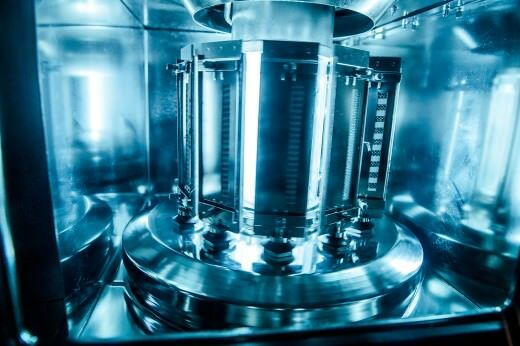 – Fragments or residues of the fabric that fall to the bottom of the test chamber shall not continue to burn for more than an average of 2s per set of 10 samples. – The average weight loss per set of 10 samples shall not exceed 40%. – No single sample’s mass loss shall deviate more than 3 standard deviations from the average.